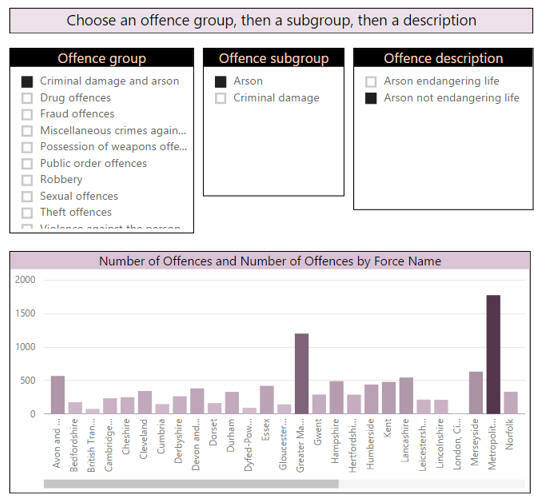 Create a new Power BI Desktop file, and import into it the 2015/16 crime statistics in the Excel workbook in the above folder (you can see where the data came from at this page, although there are a lot of datasets to choose from there!). The only columns you'll need for this exercise. You'll need to make sure child slicers don't affect parent ones, as well as applying colour saturation. Save this as Set fire to the brain, and close down your current instance of Power BI Desktop.